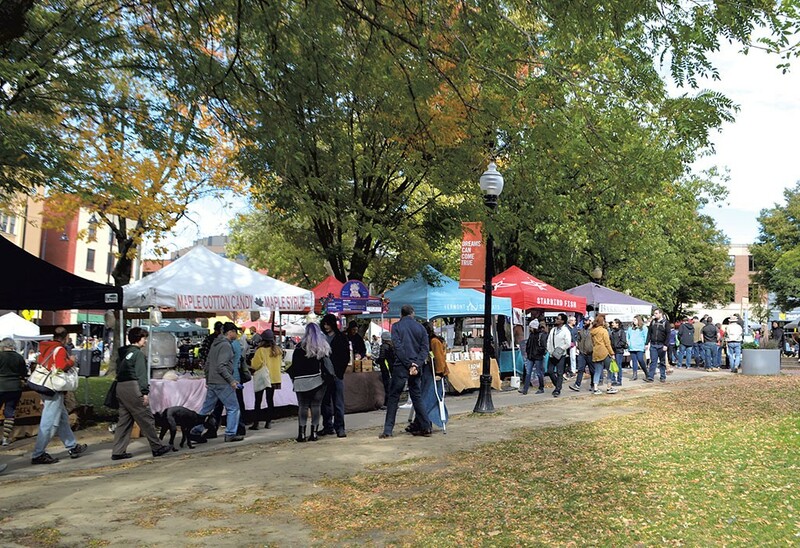 Starksboro farmer Hank Bissell set up shop on October 20 on the same corner of Burlington's City Hall Park that he's occupied every warm-weather Saturday for three decades. Passersby, tugging their dogs on leashes and carrying bags of leafy greens, stopped to view his Lewis Creek Farm's special — beets for $1.50 a pound — and the potatoes, cauliflower, peppers and 10 kinds of pickles he had on display. A trio played bluegrass tunes nearby, and a toddler danced, shuffling through yellow leaves that littered the ground. Such scenes, typical of the Burlington Farmers Market, won't play out in the park next year. The market, a nonprofit organization led by a vendors' steering committee and two employees, is hunting for a new home as the City of Burlington moves forward with plans to upgrade the downtown green space. The summer-months staple must relocate during renovations, which the city plans to begin next spring and which should take at least a year. But just six months before the crowds are to return for the next outdoor market, organizers aren't yet certain what the future holds, or where its vendors, mostly small farmers, will sell their crops. "They're frustrated, and they're scared," said Chris Wagner, the organization's executive director. The market's leaders have been laboring under the impression that if and when the market returns to City Hall Park, it would be drastically smaller. After initial discussions with city officials, market leaders believed the new park would accommodate just 63 vendors, compared to the 93 that hawked their wares there this year, Wagner said. Even then, those invited back would have to shrink the size of their stalls, Wagner feared. Late last week, Mayor Miro Weinberger called a meeting to reassure the market that would not be the case. "I think we're going to emerge on the other side with a park and a farmers market that's stronger than ever," Weinberger said of the renovation. He called the market "one of the magical parts of Burlington summer" and said he planned to keep it that way. "If we need to address some questions ... that's what we'll do," he said. The market's member vendors will discuss those questions at a November 5 meeting and weigh in on whether to move the weekly event, temporarily at least, to a dirt parking lot owned by Dealer.com along Pine Street in the city's South End. The market's steering committee will decide the question by mid-November, Wagner said. The move would change the vibe of the market, which has become a melting pot of shoppers and an economic driver for the city, said Bissell. At City Hall Park, "people come, and they want to hang out," he said. "You get [a farmers market] in a hot parking lot, there's a reason no one's going there. It's miserable." Bissell nonetheless supports the move, believing that it's the best option for the farmers and for the city — for now. The market has been a downtown Burlington institution for nearly 40 years, ever since a couple of AmeriCorps volunteers and a half dozen farmers who wanted to sell their vegetables founded it in 1980, according to Wagner. It's operated in City Hall Park since 1982. The gathering of growers started small. 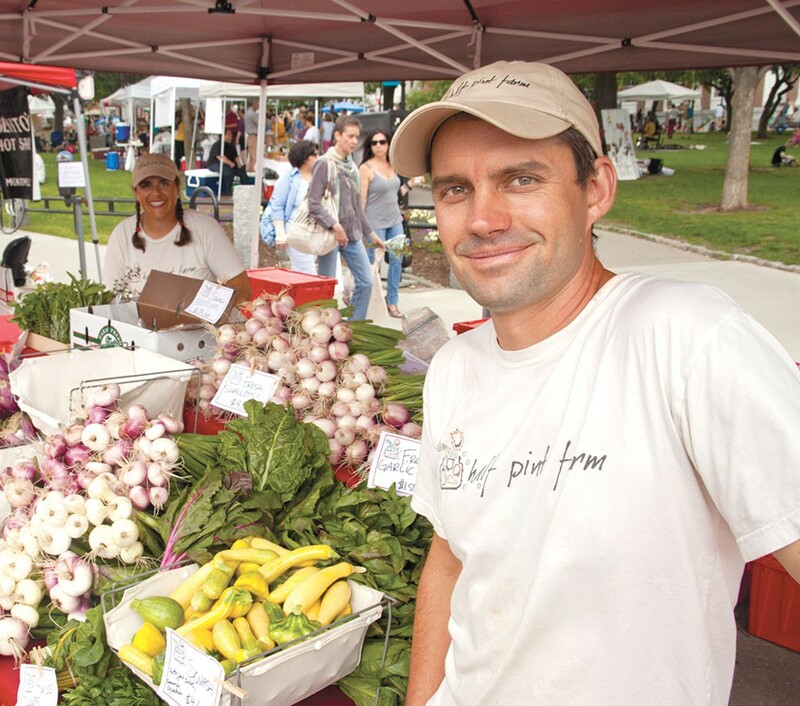 Since Wagner started working for the market in 2006, the number of vendors has tripled as younger people have taken up farming and the locavore movement has burgeoned, he said. Attendance has also risen, Wagner said: Volunteers counted 10,000 visitors during one summer day in 2016. On November 10, with this summer's season over, the market moves to its winter locale at the University of Vermont's Dudley H. Davis Center. Smaller crowds and shortened hours make for a smaller affair during the colder months; the outdoor summer market resumes in May. It's earned accolades from afar. The Daily Meal, a food website, ranked the market 15th on its 2017 list of the country's top farmers markets. Another website, UrbanDaddy, counted the Queen City alongside Fez, Morocco, and Hanoi, Vietnam, as one of the most underrated food cities in the world — and specifically highlighted the farmers market. Its location, just off of Church Street, has helped the market grow in prominence and boosted the city's locavore vibe. In an internal survey, 80 percent of vendors called City Hall Park the key to the market's success, according to Wagner. City officials have considered renovating the park since 2011. The soil has gotten compacted, and well-trodden bare spots run along its sidewalks. The park has been "loved to death," David White, the director of planning and zoning, has said. The proposed redesign, which would cost $3 million, includes a new fountain, wider walkways, a bathroom and a permanent kiosk. The renovations are supposed to start in the spring of 2019. But a citizens' group, Keep the Park Green, is trying to stall the effort, protesting that too many trees would be cut down. They're collecting signatures for an advisory Town Meeting Day ballot item that would ask voters to halt the project entirely. Regardless of any results, Weinberger said, he intends to pursue the makeover. The uncertainty is nothing new to Wagner — or to the market. It's operated with one-year leases for the past four years, because the park's renovation has been up in the air. In the meantime, market leaders investigated alternative sites, Wagner said. He and the market's board president, Spencer Welton, co-owner of Half Pint Farm in Burlington's Intervale, examined 17 potential sites, including several parks, private lots and even a field by Interstate 189. All posed challenges, Wagner said. More than three consecutive Saturdays at the waterfront would require a change to the city's Act 250 permit. Battery Park couldn't accommodate unloading for vendors and parking for customers. Oakledge Park floods when it rains. Market organizers settled on the lot along Pine Street. The location isn't as convenient, but there are perks, Wagner said. While the market pays the city $15,000 annually for its use of City Hall Park, Pine Street property owner Dealer.com will charge just $60 for the year. There's room for 120 vendors and plenty of parking. The vendors on the market's steering committee will vote in November on whether to commit to the site, even though the city can't guarantee it will have shovels in the ground next summer. Wagner is pushing for approval. "It's time for us to be proactive rather than reactive," he said. City decisions have already affected the market. It had to leave its winter home in Memorial Auditorium after the city's downtown building was condemned in 2016, and it relocated to UVM. The city is considering redeveloping the auditorium. The farmers market was also a central part of the plan to redevelop the old Moran Plant on the Lake Champlain waterfront. That fell through last year. "It is hard to have no real home and to have no real say where our home will end up being," said Welton. "We are at the whim of the city's plans, and we've got to make our own way in the interim without a ton of help." He said he hopes for more "support and appreciation and communication" with city officials. Interviews by Seven Days suggest communication with the city has been poor. Wagner and many vendors believed that the new park configuration would restrict space the market now uses, should it return. Less than 24 hours after Seven Days requested an interview with Mayor Weinberger and other city officials regarding the market, the mayor reached out to Wagner. Weinberger reiterated his support for the market and vowed that any reduction in space would be minor, according to Wagner. That, he said, was a surprise. Weinberger also said that the market could return to City Hall Park after one year. Some city departments had previously indicated that the park would be off-limits for two years, according to Wagner and other market officials. "Some details have to be ironed out," Weinberger acknowledged to Seven Days. That's not good enough for the farmers who stand to lose out. "We're talking about ... 100 different businesses that are all mom-and-pop that all rely on this to make a living, and it's up in the air," said Kyle Doda, the owner of 1000 Stone Farm in Brookfield. Doda thinks the city should be more supportive because the market brings revenue to nearby businesses and gathers the community together. "Our clientele is all ages, all races, all ethnicities," he said. Meanwhile, the market vendors have been bracing for what they thought would be an inevitable 30 percent reduction of stands should the market return to a rebuilt park. The seniority system means the newest vendors, including Doda, would be the first to go. If such a scenario did play out, Jonathan Wagner — no relation to Chris — and his Bear Roots Farm would be cut. Wagner sells his produce at the farmers market in Montpelier and through a CSA but said he makes roughly half of his income at the Burlington market. He and his wife had bought another piece of land recently, assuming they could count on the revenues from the vegetables they sell in Burlington. "For us personally, [losing the market stand] could make things unsustainable," he said. Chris Wagner said he thinks the organization has had plenty of support from the city. He sees Weinberger making the rounds every Saturday. "There's no doubt the community loves the market," he said. Still, Wagner acknowledged he would need to work harder to draw people to the Pine Street location. If it's chosen, he plans to run advertising and might pay for a shuttle for those in the Old North End or senior living facilities who would not be able to walk to the market. Wagner was hesitant to commit to returning to the downtown park. "We just want the renovations to happen," he said. "Then we can look at that space and decide: Is this the best spot for the farmers market?" So, how big will the market be after next year — and where will the tents sprout? "I honestly don't know," Wagner said.